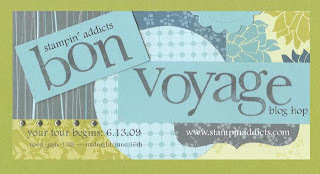 Roaming Stamper: Announcing a Blog Hop!! I know I've neglected my blog and I'm apologizing now but I'll make it up to you this weekend! I am participating in a blog hop with my fellow Stampin' Up! demonstrators over at Stampin' Addicts. We are busy creating projects with stamps from the Last Chance List. Check back here on noon Saturday to see the projects I've done and then continue to hop from blog to blog with even more great projects. See you Saturday! !